Lake City, Minnesota — To Ralph Lentz, the answer to the question of whether stream banks should be grazed is as simple as A-B-C.
“C,” the furthest downstream, was fenced off and planted to several hundred trees in 1967 as part of an approved Soil Conservation Service (now National Resources Conservation Service) conservation plan that was supposed to be expanded to the entire one-third mile length of this streamside property. But Ralph, then a high school vo-ag teacher, never found the time to do the rest of the fencing and planting. His beef cow-calf herd was allowed access to the stream banks, first for long periods of time, but later for increasingly short intervals as Ralph’s interest in management-intensive grazing (MIG) grew. In the mid-1980s he subdivided the pastured streamside property into two separate areas in an informal attempt to gauge the effects of two different grazing regimes. 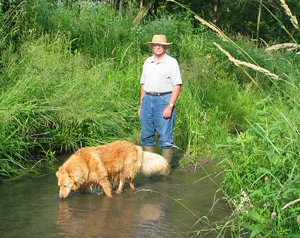 In recent years 40 cow-calf pairs have grazed the upstream portion of the creek, Section “A,” for two or three consecutive days each month as part of Ralph’s normal rotation on his 100-acre farm. Meanwhile the middle piece, Section “B,” has been grazed for as little as one, intense event every two to three years to control vegetation growth – including trees. The differing A-B grazing practices are part of Ralph’s friendly ongoing debate with Larry Gates, watershed coordinator with the Minnesota Department of Natural Resources, over just how much access cows should have to creeks to provide some sort of balance between income and stream quality. And after two to three decades, the results of these differing management schemes are obvious to the eye – at least the differences between Section C and the Section A/B combination. The Section C stream is broad and shallow with a muddy bottom and murky water. The bare banks are tall and steep with exposed tree roots. The creek bottom is blocked in dozens of places by trees that have fallen because their roots were undercut as banks eroded during period floods. Further upstream, it is difficult to believe that this could be the same creek. The banks of sections A and B are covered with thick growths of grass, the creek is much narrower and deeper, and the water runs fast and clear. At least visually, the differences between these “A” and “B” are subtle. “B,” which is charged by cold water from Ralph’s spring-fed pond, runs a bit faster, and is as deep as it is wide. Compared to “A,” there is slightly greater variety in the plants that cover its banks. Testing has scored “B” a bit higher for overall water and habitat quality. Electroshocking surveys Gates took in October 2000 found that “B” had more than twice as many fish as “A.” However, nearly 30% of the “B” fish total were brook trout that had been stocked in the adjacent, cold-water farm pond. Gates notes that Section B water temperatures are thus well below those of the “A” section that is upstream from the pond, making this section more capable of supporting brook trout. Meanwhile, the wooded and eroded Section C, which is just downstream, held less than one-fifth the fish recorded in “B.” Gates recorded 29 brook trout in Section B, but just three in the shallow, muddy Section C.
Both “A” and “B” boast more than double the number of plant species found in the wooded “C” section. “A” runs swifter and clearer than the average creek in this part of Minnesota. The banks of this upstream section are also covered with grasses in all but one section, which has some trees and moderately eroded banks on one side of the stream. What’s the problem with this section? Ralph has long had a “hospital” paddock for problem cows on that side, and has chosen to keep those cattle fenced away from the creek. In the near future he will likely fence that paddock “in” to the stream to improve stream habitat. So much for conventional conservation wisdom. Perhaps the choice is really between “1-A,” and “1-B.” While Gates favors the two-year rest periods of Section B, Ralph believes that Section A’s brief, but regular periods of animal impact, followed by month-long rest periods, provide an excellent compromise between adequate fish habitat and adequate productivity. 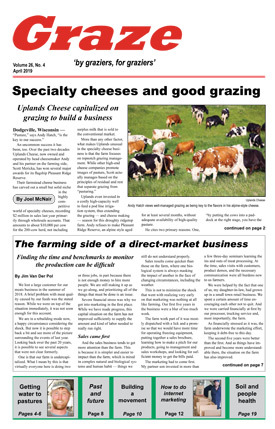 “Section B has more fish and more plant variety, and it’s producing more beef than a fenced out buffer area,” Ralph acknowledges. “But it is not producing as much beef as Section A. 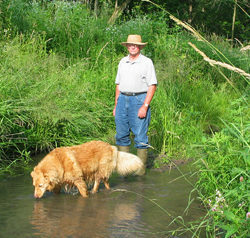 From a farmer’s standpoint, the management of ‘A’ is not harming the stream.” He believes that if graziers are to follow the lax regime of Section B in an effort to maximize trout habitat, they should receive compensation from government conservation agencies to recognize their lower productivity.